The display mode can be changed between trip meter A and trip meter B by pressing the selector while one of them is displayed. The selected mode will be displayed. • After the ignition is switched to OFF from ON. • After the driver's door is opened. When trip meter A is selected, TRIPA will be displayed. When trip meter B is selected, TRIP B will be displayed. 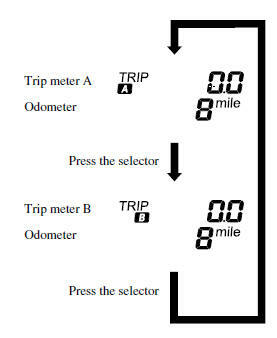 The trip meter records the total distance the vehicle is driven until the meter is again reset. Return it to “0.0” by holding the selector depressed for 1 second or more. Use this meter to measure trip distances and to compute fuel consumption. • Only the trip meters record tenths of kilometers (miles). • The power supply is interrupted (blown fuse or the battery is disconnected). • The vehicle is driven over 9999.9 km (mile). 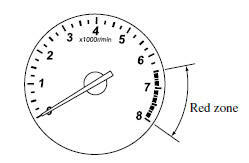 The tachometer shows engine speed in thousands of revolutions per minute (rpm). Do not run the engine with the tachometer needle in the RED ZONE. • After refueling, it may require some time for the indicator to stabilize. In addition, the indicator may deviate while driving on a slope or curve since the fuel moves in the tank. Rotate the knob to adjust the brightness of the instrument cluster and other illuminations in the dashboard. 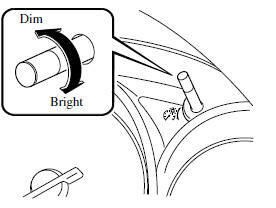 • When the dashboard illumination brightness cannot be adjusted any more, a beep sound will be heard. When driving on snowy or foggy roads, or in other situations when the instrument cluster's visibility is reduced due to glare from surrounding brightness, cancel the illumination dimmer and increase the illumination intensity. To cancel the illumination dimmer, rotate the knob clockwise fully. You will hear a beep sound and the illumination dimmer will be canceled. illumination knob counterclockwise to activate the illumination dimmer. When the ignition is switched ON, the outside temperature is displayed. • Significantly cold or hot temperatures. • Sudden changes in outside temperature. • The vehicle is parked. • The vehicle is driven at low speeds. The outside temperature unit can be switched between Celsius and Fahrenheit using the following procedure. 1. Press the INFO button with the ignition switched off and continue pressing the INFO button for 5 seconds or longer while switching the ignition ON. The outside temperature display flashes. 3. Press and hold the INFO button for 3 seconds or longer while the outside temperature display is flashing. The outside temperature display illuminates. • The approximate distance you can travel on the available fuel. • The average fuel economy. • The current fuel economy. • The average vehicle speed. If you have any problems with your trip computer, consult an Authorized Mazda Dealer. This mode displays the approximate distance you can travel on the remaining fuel based on the fuel economy. The distance-to-empty will be calculated and displayed every second. • Even though the distance-to-empty display may indicate a sufficient amount of remaining driving distance before refueling is required, refuel as soon as possible if the fuel level is very low or the low fuel warning light illuminates. • The display will not change unless you add more than approximately 10 L (2.6 US gal, 2.2 Imp gal) of fuel. • The distance-to-empty is the approximate remaining distance the vehicle can be driven until all the graduation marks in the fuel gauge indicating the remaining fuel supply disappear. This mode displays the average fuel economy by calculating the total fuel consumption and the total traveled distance since purchasing the vehicle, reconnecting the battery after disconnection, or resetting the data. The average fuel economy is calculated and displayed every minute. To clear the data being displayed, press the INFO button for more than 1.5 seconds. After pressing the INFO button, - - - L/ 100 km (- - - mpg) will be displayed for about 1 minute before the fuel economy is recalculated and displayed. This mode displays the current fuel economy by calculating the amount of fuel consumption and the distance traveled. Current fuel economy will be calculated and displayed every 2 seconds. When you've slowed to about 5 km/h (3 mph), - - - L/100 km (- - - mpg) will be displayed. This mode displays the average vehicle speed by calculating the distance and the time traveled since connecting the battery or resetting the data. Average vehicle speed will be calculated and displayed every 10 seconds. To clear the data being displayed, press the INFO button for more than 1.5 seconds. After pressing the INFO button, - - - km/h (- - - mph) will be displayed for about 1 minute before the vehicle speed is recalculated and displayed.